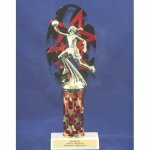 11.75" Star backdrop, Fig & Col.
RED Star Rhythm 'L' shaped Backdro with basketball figure on 4 in. column. Approx. height 11.75".